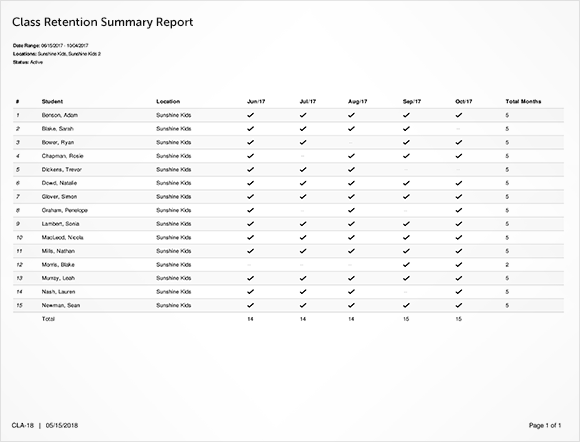 iClassPro’s Class Retention Summary report is designed to give your business an overview about the longevity of student class enrollments at your business. This report can be found under Reports > Classes > CLA-18: Class Retention Summary Report. This report displays a list of active students within a given date range. The report will include a column for each month within the date range you have entered. If a student was actively enrolled in a class that meets the search criteria, a check mark (PDF) or Y (XLS/CSV) will appear in the column for the corresponding months. (Note: This does not mean that the student was necessarily enrolled for the entire month, but that the student was enrolled in a class for at least one day out of the month.) The total number of months the student was enrolled over the date range is added up in the last column of the report so that it is easy to look for patterns. Similarly, each month column will list a total number of enrollments found for that month at the bottom of the report. To run this report, it is required to enter a date range and to select at least one location from your account. To select a date range, enter a start date and an end date for the time period you want to examine enrollments over (limited to 12 months or less). Then check the box next to the location(s) to include in the search. 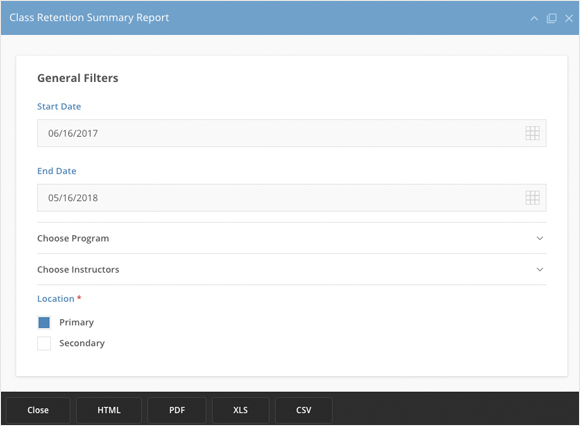 There are several other filters for this report which are not required, but do allow you to dive deeper into enrollment patterns at your business. When using multiple selections under one of these filters such as instructors – enrollments for any of the selections (instructors) will be displayed. This does not limit the results to only students tied to both selections (instructors). Program – lists any students enrolled in classes with the selected programs. Instructors – lists any students enrolled in classes with the selected instructors attached. Class Status – restrict enrollments to only classes that are set as active or inactive, or select both to review all classes with enrollments over the chosen date range. Class – lists any students enrolled in the selected class(es).